The Fimiani brothers of Firenza Stone hosted an Interior Designer/Realtor mixer at their beautiful showroom in Willoughby, OH. The building itself was nicely designed with lots of natural lighting pouring into the windows. Stone, tile and other surface materials were beautifully displayed. 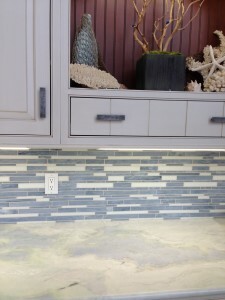 They had kitchen and bath vignettes displaying their cabinet and countertop materials. 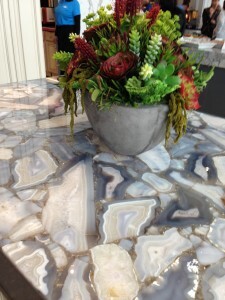 Their island displaying an agate countertop which was backlit was particularly stunning. Pricey for any budget but it makes a huge impression. I attended their continuing education class on Dekton cladding material presented by Cosentino. Dekton is virtually indestructible and is a great choice for countertops. Dekton would be suitable for outdoor kitchens because it is UV resistant, resistant to scratching and stains, resistant to fire and heat, resistant to abrasion, virtually zero porosity and has a transferrable warranty. It was a lovely evening having met some interesting people. The food and drink offered was particularly scrumptious. I will definitely keep them in mind for any of my stone needs. Alexander Interiors: Award-Winning Custom Interior Design, Architectural Detailing and Space Planning Based in Ohio and Virginia with Projects Throughout the United States.